Low End Theory founder and an icon of West Coast movement, Gaslamp Killer presents Episode XV of the outstanding podcast series, this time featuring himself and the ever-mysterious Lorn (in a much too-short mix). 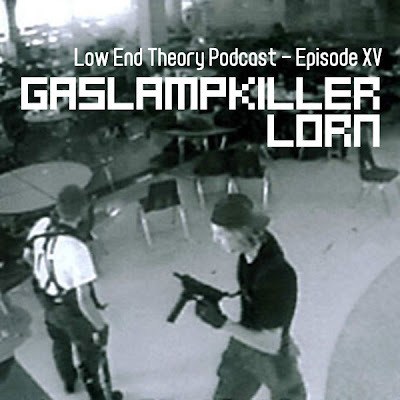 Expect the unexpected proves again to be the case in Gaslamp Killler's mix - a great selection of weired sound bites, where heavy sub-bass sits next to the funky trumpets to be followed by dreamy IDM trips and cinematic score! But honestly I was much more interested in Lorn's part, as I am his big fan since his Biggie's remixes and mesmerizing Grief Machine EP, but most of all after listening to Nothing Else - his debut full-length to drop in just a few days on the mighty FlyLo's Brainfeeder. This is the record of the year for me without a doubt, but you would be surprised if you expected only stuff from Nothing Else in Lorn's LET's mix :) It's much more. Sick mix - just listen! PS. Pre-order Lorn's album directly from him to get a signed copy + other personalized goodies.